Fits 5x3mm oval shaped stone with 2) 1.7mm accents (stones not included in price but available as an optional purchase). Made to order in 10k yellow, white or rose gold, 14k yellow, white or rose gold, 18k yellow, white or rose gold, palladium or platinum. 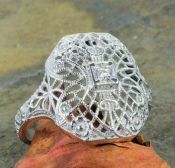 Fits a 1.5 to 1.7mm round stone surrounded in intricate filigree (stone not included in price but available as an optional purchase). Cast to order. Fits a 1.5 to 1.7mm round stone or .03 to .05 carat diamond. Sold as setting only, gemstone and sizing is optional. Cast per order in 10k yellow, white or rose gold, 14k yellow or white gold, 18k white or rose gold, palladium or platinum.